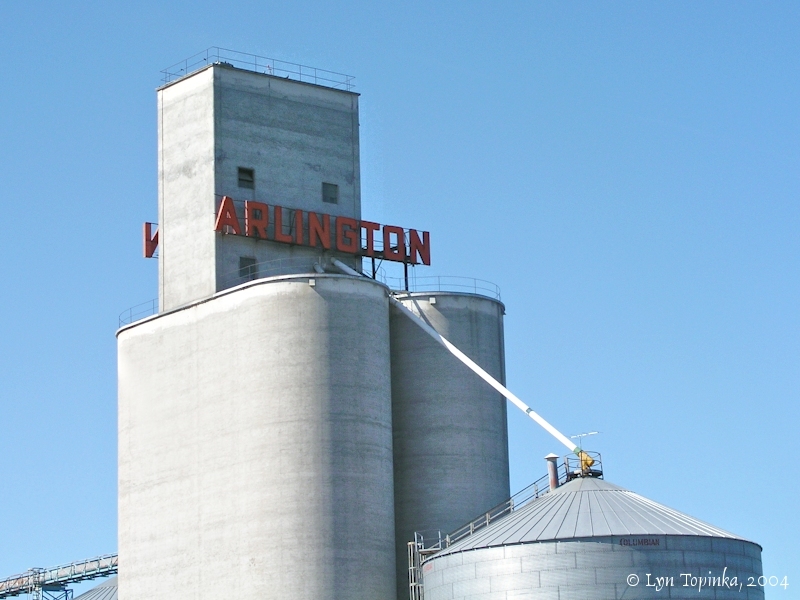 Click image to enlarge Arlington, Oregon. 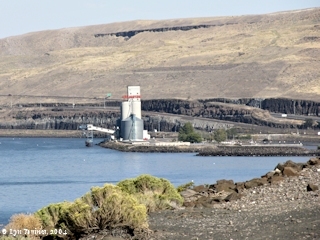 View taken from Oregon Interstate 84, downstream of Arlington, Oregon. Image taken September 26, 2004. 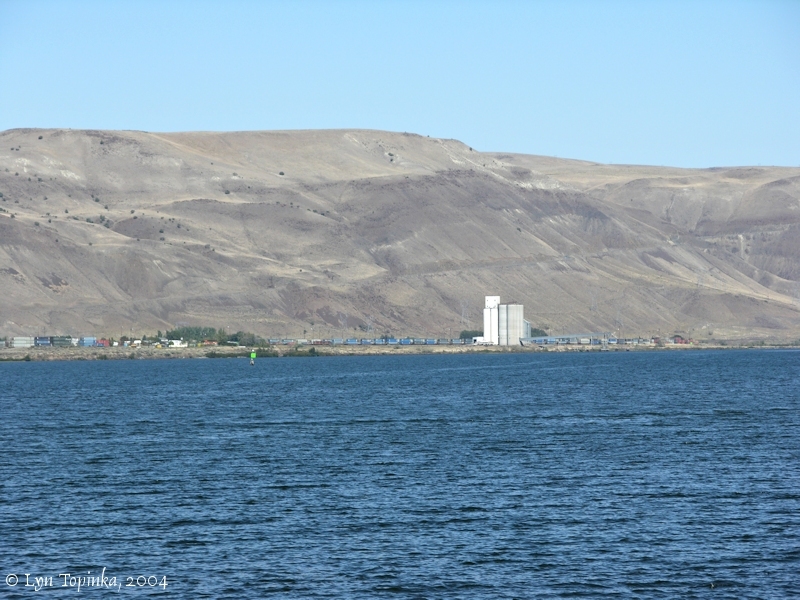 Arlington, Oregon, is located on the southern banks of the Columbia River at River Mile (RM) 243, directly across from Roosevelt, Washington. 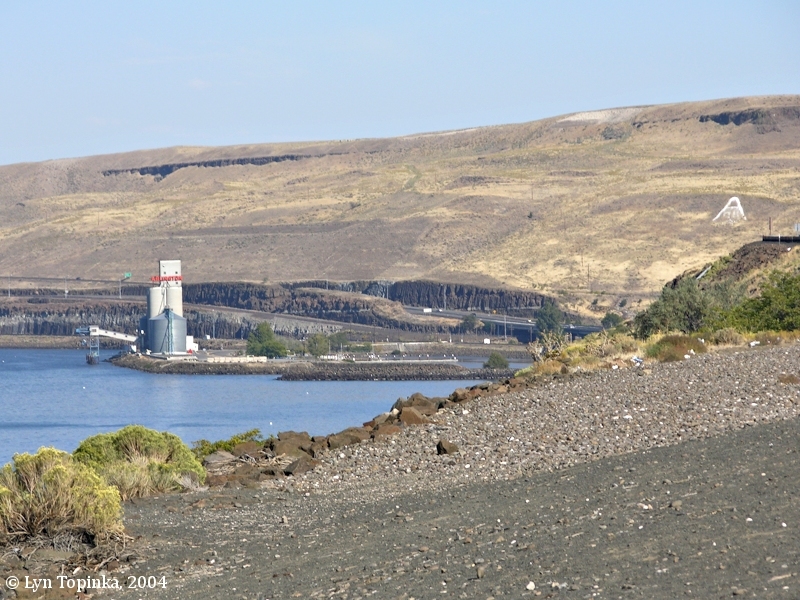 Twenty-five miles upstream is the Oregon community of Boardman, and 23 miles downstream is the John Day Dam. Arlington lies at the mouth of Alkali Canyon, and, in pioneer days the town was known as Alkali. "Local residents did not consider the name Alkali suitable for a growing community, and at a town meeting N.A. Cornish suggested that the town be named Arlington, supposedly because there were a number of southerners living in the community at the time and it was the home of Gen. Robert E. Lee. However, an ulterior motive lay hidden, for many years later his daughter, Nellie C. Cornish, in Miss Aunt Nellie, p.28, says the name was selected to honor her father, whose full name was Nathan Arlington Cornish. Cornish apparently neglected to mention this connection, and the honor went unknown, at least during his lifetime." 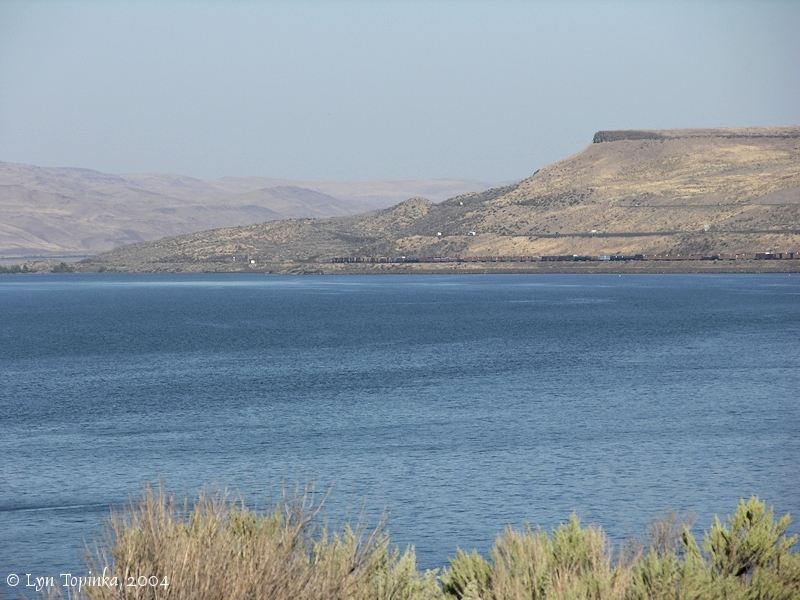 Lewis and Clark went past the Arlington area twice, however they never stopped. 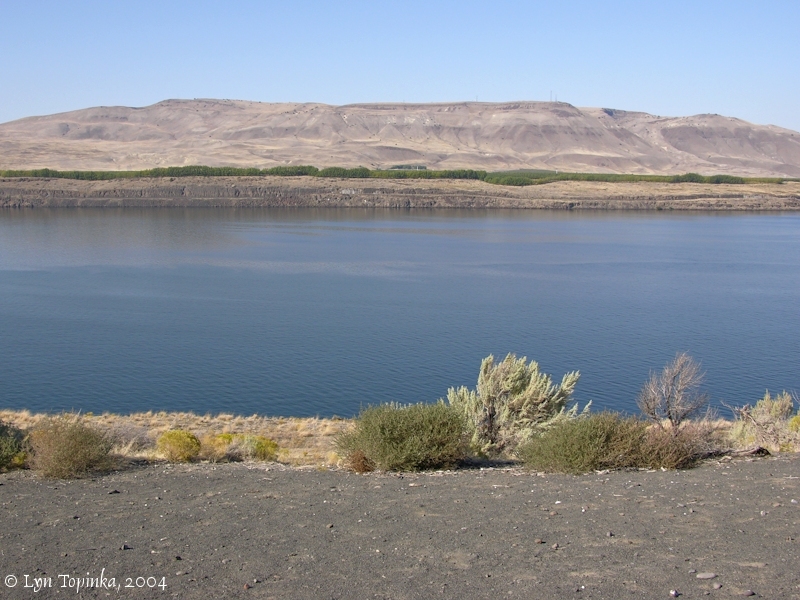 They first entered this reach of the Columbia on October 20, 1805, and camped across the river near Roosevelt, Washington. On their return in 1806 they were on horseback on the north side of the river and they once again camped near Roosevelt. 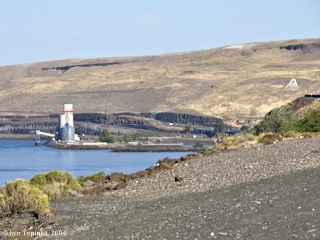 The hills on the right ("Starboard Side") rise above the Washington community of Roosevelt. "... ARLINGTON, 46.5 m. (224 alt., 601 pop), first known as Alkali, was given its present name by N.A. Cornish in commemoration of the home of Robert E. Lee. The first dwelling was erected on the site in 1880 by Elijah Ray, and the town of Alkali was platted two years later by J.W. Smith. The town was incorporated in 1887. Ducks and geese are plentiful in the vicinity; the open season is from October 21 to November 19, inclusive. Hunting rights are often rented from the ranchers at $8 to $10 a day. 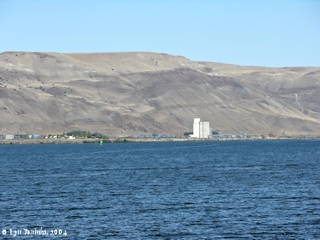 The Arlington Ferry (cars, $1 ; round trip, $1.50) makes connections with Roosevelt, Wash. At Arlington is a junction with State 19. ..."
Click image to enlarge Arlington, Oregon. Image taken September 24, 2004. 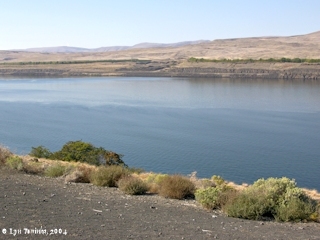 Alkali Canyon extends south from Arlington, Oregon and then heads west to Rock Creek, a tributary of the John Day River. 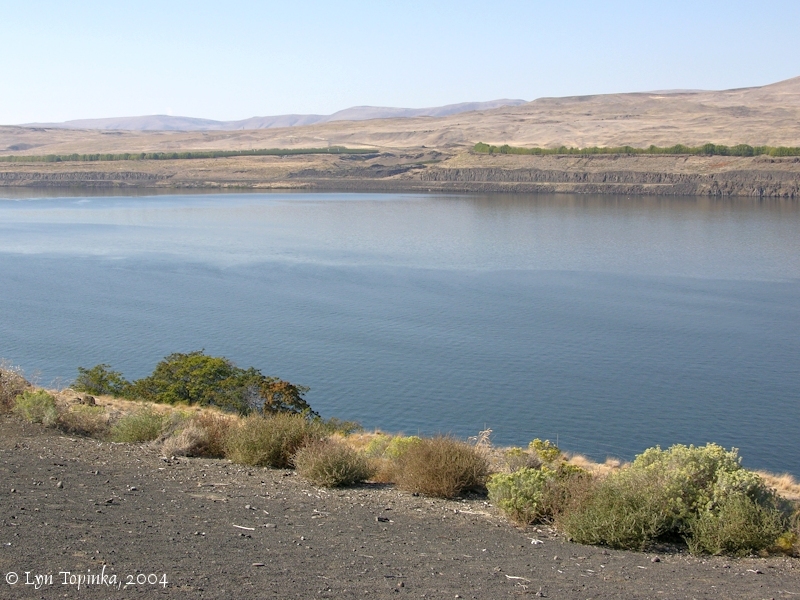 Flood waters of Lake Condon of the Missoula Floods spilled over the southern bank of the Columbia River and headed south through Alkali Canyon to Rock Creek to the John Day River and then the John Day River drainage back to the Columbia River. Arlington's "hillside letter", a big letter "A", is located on the hillside on the southeast side of town and is prominently visible when approaching the city from the west (Interstate 84). 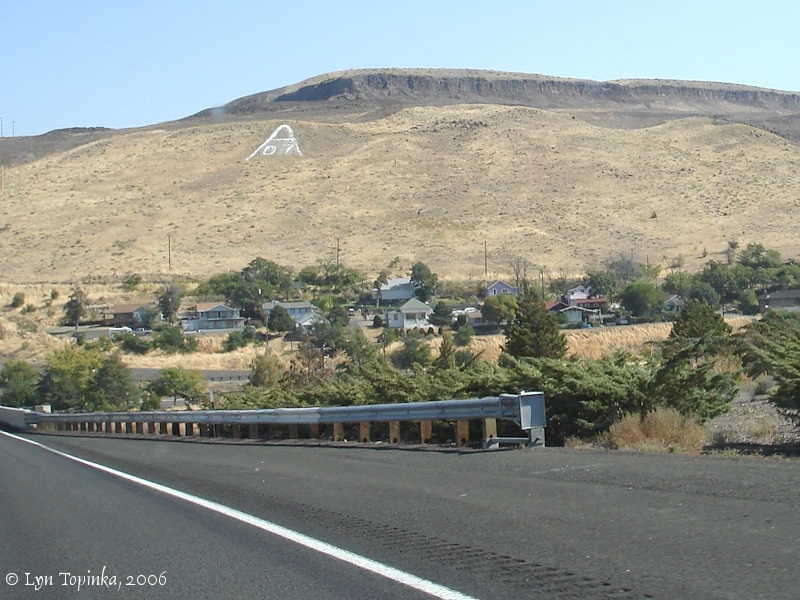 Click image to enlarge Arlington, Oregon, with large "A" on slope. 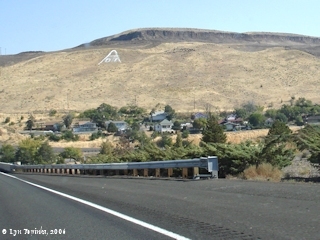 View taken from Oregon Interstate 84, downstream of Arlington, Oregon. Image taken September 26, 2004. 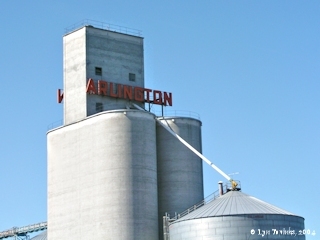 Click image to enlarge Arlington, Oregon. View from Interstate 84 heading east. Image taken September 29, 2006. 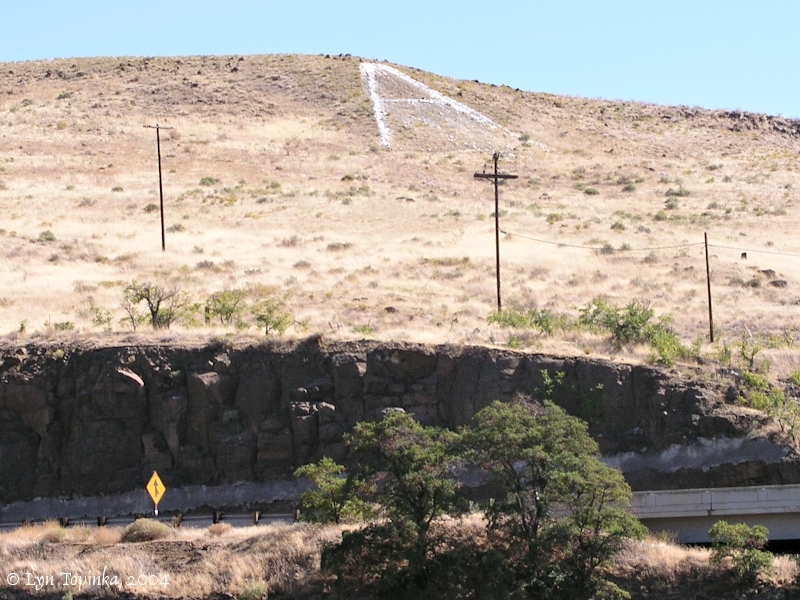 Click image to enlarge The "A", Arlington, Oregon. Image taken September 24, 2004. A ferry once connected Arlington, Oregon, with Roosevelt, Washington. Joseph Smith Buys Ferry Oregon. 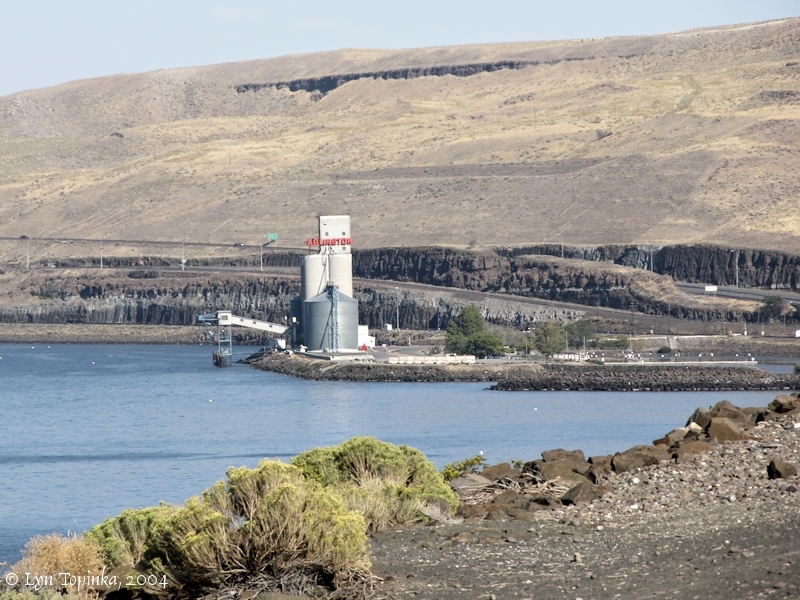 "Custom-House officials have been apprised that the Arlington-Klickitat Ferry Company has sold its ferry, documented as the steamer Oregon, to Joseph Smith. The craft plies between Arlington and the north bank of the Columbia. Mr. Smith plans to continue the service." Source: "Morning Oregonian", September 24, 1910, courtesy Historic Oregon Newspapers Archives, Univeristy of Oregon Libraries, 2016. 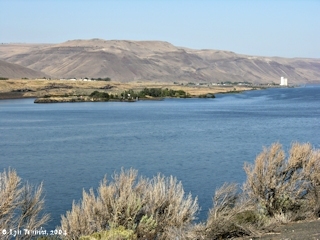 Click image to enlarge Bank of the Columbia River just upstream of Arlington, Oregon. Image taken September 26, 2004. A good view of Roosevelt, Washington and the Washington hills upstream and downstream can be had from Arlington. 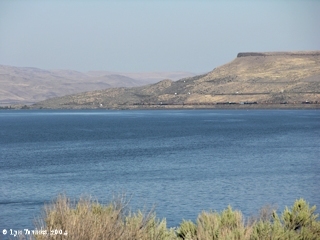 Click image to enlarge Roosevelt, Washington, from Arlington, Oregon. Image taken September 24, 2004. 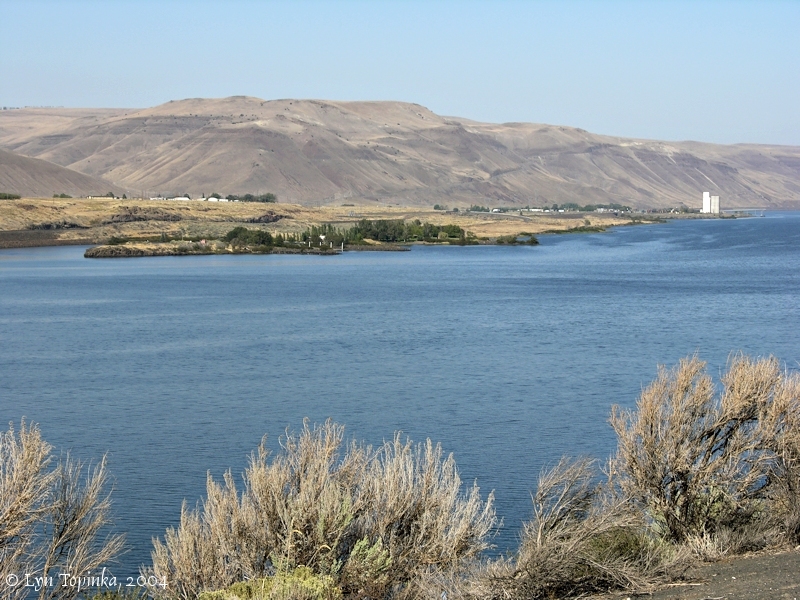 Click image to enlarge Washington hills downstream of Roosevelt, Washington, as seen from downstream Arlington, Oregon. Image taken September 24, 2004. 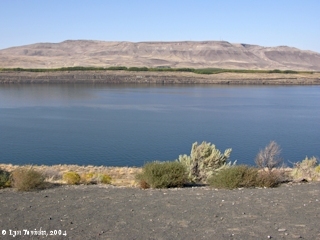 Click image to enlarge Washington hills downstream of Roosevelt, Washington, as seen from downstream Arlington, Oregon. Image taken September 26, 2004.